Right now the Cons are "reviewing tapes of every call made by the Responsive Marketing Group call centre in Thunder Bay in the last election before Elections Canada investigators arrive next week," reports CBC, before adding the Cons deny it. Presumably Steve would be in search of exactly where to place his own 18 minutes of tape hiss or RoboConfetti. So after four decades of simply adding the suffix -gate onto the scandal du jour - from cleavagegate to gazebogate - Canada finally gets to watch Steve watergate the question : What Would Milhous Do? On Tuesday Steve pledged to get to the bottom of the lone, single, solitary, isolated, rogue robocalling incident, but by yesterday - with thousands of voters reporting electoral fraud clear across the country - their new story is that it's all just a case of "Liberal and NDP sleaze", a giant RoboConspiracy! Thank you, Senator Finley, for that moment of lucid RoboContemplation. Speaking of in-and-out shenanigans, here's the new robocalling edition. Quebec Con candidate Bertin-Denis told Le Devoir and two radio stations yesterday that $15,000.01 was funneled into his riding and right back out again in the last election, ostensibly for local RMG poll research that he never saw. Really? A Con candidate said that? Oh wait, he has since mysteriously recanted that accusation - a RoboConcaving. "I think they've identified the individual that was involved in this," he said. But I guess the God of the Rescue Helicopter Taxi Service wasn't listening because by Tuesday Mr. Sona was publicly protesting his innocence and expressing his hope the real guilty party would be caught. 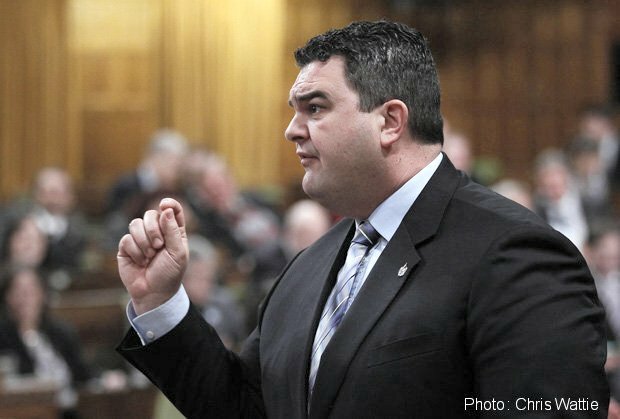 “These calls were made on behalf of the Liberal party,” Del Mastro said. Unfortunately for Mr Creosote, it was immediately pointed out he had confused the name of a US firm with the completely unrelated but identically named Canadian one used by the Libs, but no matter : Corporate Television Vehicle ran with it anyway. RoboComplicity. Still, you can see why the Cons instinctively turned to their the-Libs-do-it-too defence. Conservative call centre company has checkered legal history in U.S. The company that handles the Conservative Party’s computerized voter-identification system and powerful fundraising machine has a checkered legal history in the United States, where it operates call centres that have repeatedly been the subject of lawsuits and complaints over its telemarketing practices. Longtime key Conservative organizer Stewart Braddick is listed on RMG’s web site as director of the company’s Focused Direct Response program. Braddick is also listed as director, Focused Direct Response, for the American company Target Outreach Inc., which works for Republican campaigns. The Cons think they are playing us for suckers. They think we're all rubes, that we won't get it, that we'll put up with their imported Rovian Republican tactics. So - are we rubes? Are we going to let them get away with it this time? Last word on this goes to Nixon Watergate dirty trickster Donald Segretti, yesterday. His assessment? : "Worse than Watergate." Their dirty tricks campaign, Mr. Segretti claimed, was designed to disrupt the Democrats, not hoodwink voters." Mr Creosote hehe just stood up in the house and repeated the same stoopid crap about Libs using US robodialers he got laughed at for yesterday. I wonder if it amuses Steve to make them do that? This is a robo-sensational recap, Alison. Holly : Hmmm, the first solid Steve-link in the chain between the possibly roguey regionals and their minders in the nationals. Sona will be back inside shortly if he keeps his loyal yap shut. You have to figure he knows full well who it is. Like you I spent a long time connecting dots between various rollerball corp mergers and malfeasances, when all that was required of me was to notice Glen McGregor and Stephen Maher had already done that and link to it. Hence a recap post instead, partly because listening to CBC media panel today - realized story getting looose on them. What I really should have mentioned is that 3 weeks ago Cons on PROC voted down EC's request for powers to investigate properly. 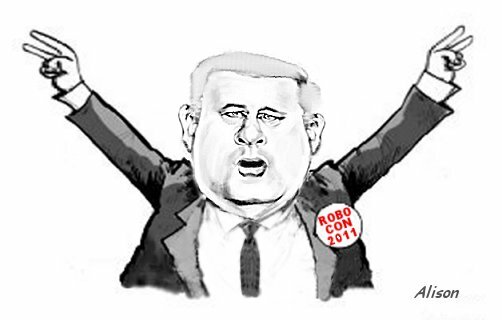 RoboContumely. Ian : I think Con MPs probably just grateful they don't have to wear costumes as well. IF they didn't know, WHY didn't they know? Mr. Creosote. I like that, it's fitting. Here's to him and his anti democratic criminal(I borrowed the phrase from blogger Norman Farrell) cohorts self explode from their gluttony and dishonesty. Alison, this is a superb piece of REAL World Class Journalism ... Creosote has me LMAOFOF, your whole piece makes me LMAO > THANKS FOR YOUR GOOD (great) WORKS FOR OUR COUNTRY. What sort of investigation takes ten months, and the Ottawa Citizen two journalists to get it going anywhere fast? The most dire threat to Canada's democratic system since the FLQ, or possibly since the Nazis. No biggie. Why are there no WANTED: REWARD $5M posters up everywhere for Pierre Poutine? Seems the 19th Century had better crime fighting.